Can the Polaroid Snap Replace Your Other Cameras? Posted by	 Leave a comment on Can the Polaroid Snap Replace Your Other Cameras? For anyone old enough to remember using them you know the perks and limitations that came with using a Polaroid instant camera. Now with the Polaroid Snap a new generation is introduced to this classic piece of photography equipment. 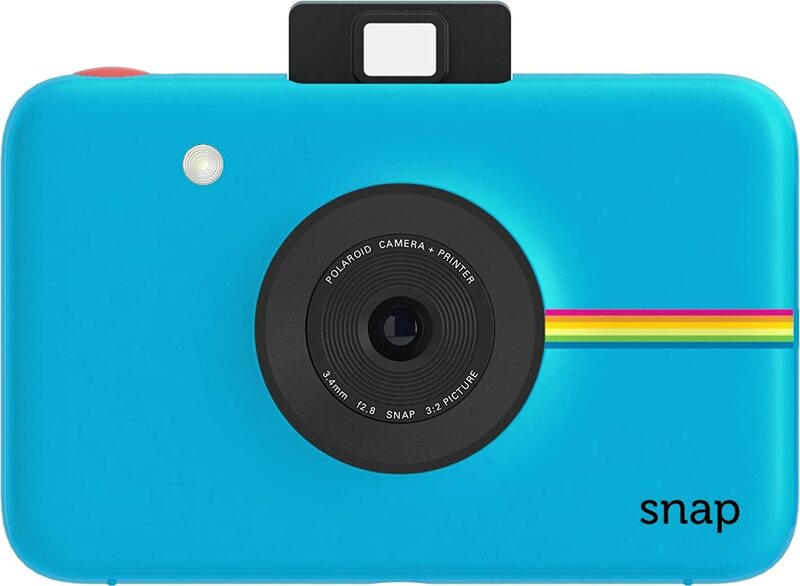 The new Polaroid Snap Instant Digital Camera is a modern twist on analog photography that instantly prints 2 x 3 photos. But gone is the big and bulky design of yesteryear. The Polaroid Digital Camera is called Snap and comes in at a sleek 3 inches high by 5 inches wide. The small design actually closely resembles the Polaroid Zip printer, but instead of printing pictures sent to it wirelessly via your mobile device (as the Zip printer does) the Snap has a built in 10 megapixel digital Polaroid camera that prints out its own photos instantly. Like old Polaroid cameras the Polaroid Snap is limited in its features. There is no zoom, no screen (you line up your photos through a pop-up viewfinder on top of the camera), and you only have three capture mode options (color, sepia, and black & white). But that is part of its charm. Read my review to see if the Polaroid Snap is something that might be a welcome addition to your home. The Polaroid Snap is small and portable so you can carry it with you anywhere without feeling encumbered. Affordable. The $99 price tag is reasonable for what you get. Because the camera uses zero ink there is no need to purchase ink cartridges. The only consumable expense is the Zink (zero ink) paper. And because there is no ink the photo prints come out dry and smudge proof. If you run out of paper don’t worry. You can still use your Polaroid Snap and store your pictures on the SD card. The camera also comes with a USB port for connectivity. The 10 MP camera means that the pictures have a decent resolution. This won’t take the place of most smartphones in terms of quality (it only has a focal length of 3.4mm and a maximum aperture of F2.8) but the novelty of instant photos is hard to resist. The Snap has a tripod mount in order to stage photos. It also has a 10 second self-timer and a photo booth mode that takes 6 photos in 10 seconds. This product can be find at most retail giants and electronic stores such as Wal-Mart and Best Buy, but you can find everything you need by clicking this Polaroid Snap Instant Digital Camera Amazon website link. There you will find the Polaroid Snap for $99.99, as well as the Premium Zink paper (30 sheets) for $14.99 and a 16GB Micro SD card for $9.49. Amazon offers free shipping & handling for all orders over $35. In looking at other Polaroid Snap reviews I think that the criticisms are consistent. The Polaroid Snap‘s capabilities are limited and the quality of the pictures aren’t on par with most basic smartphones. But that’s the beauty of it. The original Polaroid was by no means meant to take award winning photos, and the same goes for this generation’s version. I found this to be a fun throwback that actually serves a purpose besides satisfying some fond memories I have of the Polaroid cameras of my youth. This is a great product to have at family get togethers or at parties. Most people nowadays take photos specifically to post on social media sites, or they take pictures only to let them sit on their computer. I think that this would make a great gift for young kids or adults that don’t have access or choose not to post online. In fact I’m planning on getting one for my 10 year old nephew who is not allowed to have an online account yet. So can the Polaroid Snap replace your other cameras? Absolutely not. But it certainly can compliment them. This is a fun and affordable camera that makes a great gift. The only downside is having to buy the paper but it beats purchasing ink cartridges.